Mohamed Tharwat, the charge d’affaires of Egypt’s embassy in Damascus, said that an Egyptian humanitarian aid convoy has arrived in the besieged Syrian town of Douma in the Eastern Ghouta province. MOSCOW (Sputnik) – An Egyptian humanitarian aid convoy has arrived in the besieged Syrian town of Douma in the Eastern Ghouta province, Mohamed Tharwat, the charge d’affaires of Egypt’s embassy in Damascus, said, as quoted by media. "In cooperation with the United Nations and the Syrian Red Cross, Egypt succeeded in delivering the first batch of food aid, such as flour, halvah and readymade chicken in cans, to Douma," Tharwat said, as quoted by the Ahram news outlet. According to Tharwat, the aid convoy that arrived Friday is the first of a number of Egypt’s planned humanitarian aid deliveries to besieged Syrian towns. Syria has been in a state of civil war since 2011, with government forces fighting several opposition factions, including the notorious Islamic State terrorist group, outlawed in Russia and many other countries. The conflict has led to a humanitarian disaster. According to the UN, some 4.5 million people in Syria live in hard-to-reach locations, and about 400,000 of them live in the besieged areas. 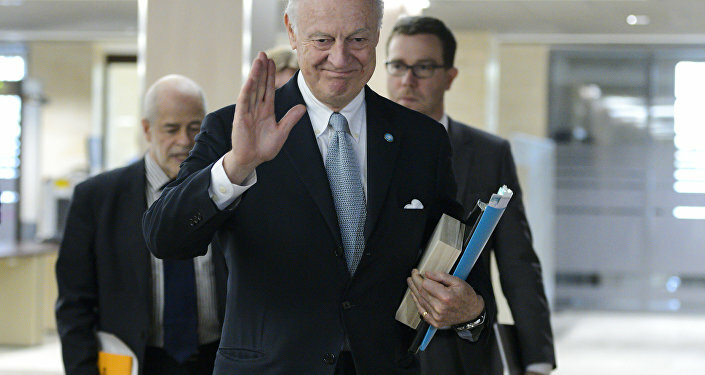 The International Syria Support Group (ISSG), co-chaired by Russia and the United States, called in the February 12 communique for swift humanitarian access to all besieged areas in Syria.